Government says comply; No more paper logs by year’s end. If you’re in the trucking industry – especially if you drive a truck for a living – your hours are going to be more scrutinized. In fact, the government has required that all truck drivers track their hours of service by using an ELD or Electronic Logging Device by December 18, 2017. Instead of paper logs, an ELD helps drivers keep track of their time on the road and ensures they are not overworked, as well as reducing the amount of paperwork that traditional logs require. ELDs are considered a safety measure; drivers might think of ELDs as a virtual assistant for working within the prescribed hours of service and keeping their runs accurate. But thanks to two big companies, the transition might be a little smoother. GPS navigation giant, Magellan, has introduced its Fleet Solutions on commercial Samsung mobile devices.These solutions are designed to help short and long-haul trucking businesses deliver optimal performance and efficiencies to drivers, while providing a secure, multipurpose device for business and personal use. This technology solution requires minimal installation for drivers and offers device flexibility to align with truck drivers’ needs. Magellan Fleet Navigation: Magellan's commercial fleet navigation software delivers truck-specific map data — ranging from maximum vehicle heights on bridges to roads allowing hazardous containers — combined with Magellan's routing engine, to provide a safety-focused navigation experience to all truck carriers. Multi-Purpose Use: Drivers not only have a device that is built for high performance and efficiencies while on the job, and features defense-grade security with Samsung Knox; it also serves as a personal device that provides access to a driver's favorite content, such as movies, books and music, for down-time while on the road. 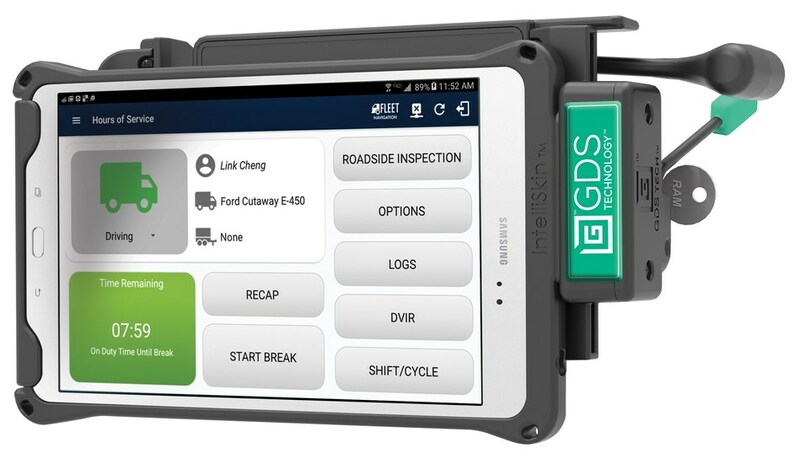 “Helping the trucking industry be compliant with ELD standards by the end of the year is critical and Samsung is committed to bringing these solutions forward,” said Kevin Gilroy, executive vice president and general manager, Samsung Electronics America. “The Magellan HOS Compliance solution is a powerful, comprehensive product that brings the best of fleet navigation software to the market. We are excited to be working in close alignment with Magellan for this program." Added Mark Perini, Magellan's Vice President of Automotive Business: “Samsung's commercial tablets with Magellan Fleet Navigation are an excellent value for fleets and drivers. We've been working diligently with the Samsung team to ensure a compliance-critical solution, and we believe our Hours of Service capability is the best in the market." Bottom-line: All trucking businesses and drivers will have to comply with using ELDs by year-end. However, before shunning the idea, think of ELDs as offering commercial fleet managers a comprehensive 'one-stop-shop' approach. After all, by going electronic, this means no one can cheat the system.